The Israel section is authored by Adena Sara Mosevitzsky, a psychiatric social worker. She met Chaim Potok in 1952 at Camp Ramah in the Poconos, and they went on to get married and had three children: Rena, Naama, and Akiva. Rabbi Dr. Chaim Potok (February 17, 1929 - July 23, 2002) was an American author and rabbi. She was Chaim Potok's first reader and editor from 1958 until his death in 2002. She has edited various organizational newsletters in the local area. 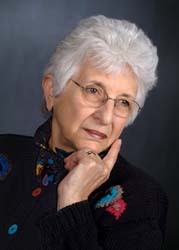 She has been active in the local Jewish community in a variety of capacities, including the Board of her synagogue, Temple Beth Hillel-Beth El, Board and Executive Committee of Federation, and president of the Boards of Akiba Hebrew Academy and Auerbach Central Agency for Jewish Education. Her professional life has been in the fields of social work and teaching and she is a clerk in the local Board of Elections. Her most recent articles can be found at her user page. July 2007: Whose life is it anyway?